The kids of Umami Mart can only be described as a fierce dynamic, set into motion by the powerful force of deliciousness, I met this awesome voltron-like force on a so-called ‘Umamiventure’. 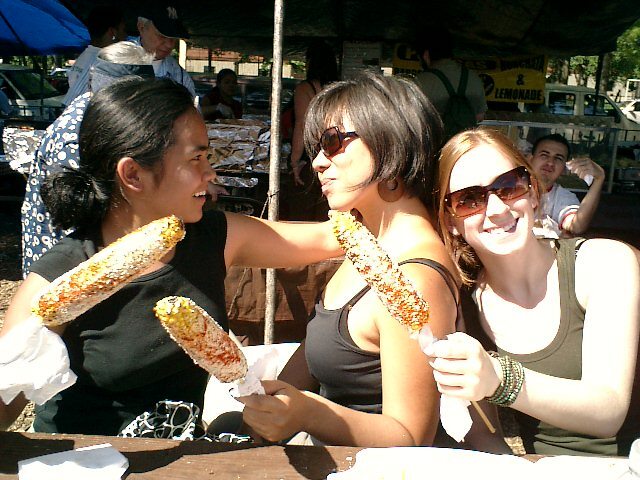 There were these Asian girls there, and some dudes too, they cackled like crazy in between mouths full of scrumptious central American culinaria…I knew then– I was among kindred spirits. so if you haven’t heard of it yet (I hadn’t until I arrived)…but the NY Times is well aware of it, despite this, if you go I promise you’ll still feel like you’re a member of a band of lucky insiders. Food vendors from many Latin countries descend upon a ball field where uniformed Latinos represent their native countries in a summer soccer league and something delicious happens. Sadly, I had only two bites…but those tiny bites impossibly included a sliver of red onion, a micro cilantro sprig, citrus bam, a succulent squid tendril, the sound of sirens, the saucy beep beep of mexico city traffic, 5 hail marys, 10 our fathers, liberation theology, can I have a hallejlujah? Ok…so corn seems SO midwestern…and the Italians claim that polenta has been on the old continent since the beginning of time, but we, the educated know that those golden ears are a New World crop. Fittingly, the Mexicans know what’s best for the vegetable. They cut a compromise, figured the French had something to contribute, (given their rich history of condiments), and so slathered the kernels in rich velvety mayo. This class act is followed by some crumbly Cotija, lime and something spicy, in this case chili powder. These ears are in this city by now totally ubiquitous, but no, I’m not sick of it, especially when it’s served up with a side of lovin’ futbol. I friggin’ love it…foods with real history are NEVER formulaic. Huarache (a deep fried vessel for the venerated chorizo)! Is it any wonder these people came up with the intricate wonder of the plataresque? In the mighty Chorizo, no ingredient is a stranger, every friend in this casing is so tight you’d think chorizo was actually the sixth basic taste (i.e. sweet, salty, bitter, sour, umami, chorizo), and there is a generous heap of it in a large fluffy fresh fried tortilla like thing…let me repeat…chorizo in a fluffy fresh fried tortilla thing…uh, yeah. Don’t you get annoyed when people remind you that cucumbers, like tomatoes are fruits NOT vegetables? Well, Mexico never lost sight of this fact and to prove it they serve it up alongside 2 fruit kingpins…the mango and the watermelon…the kicker is, is that they serve all three with lime, chili powder and salt. This is the pause that refreshes. These lovely fruits are served at the agua fresca stand where there are at least 5 varieties of said beverage in addition to Horchata! The version here is so rice milky and cinnamony it’ll blow your mind! And then it’ll bust your gut! 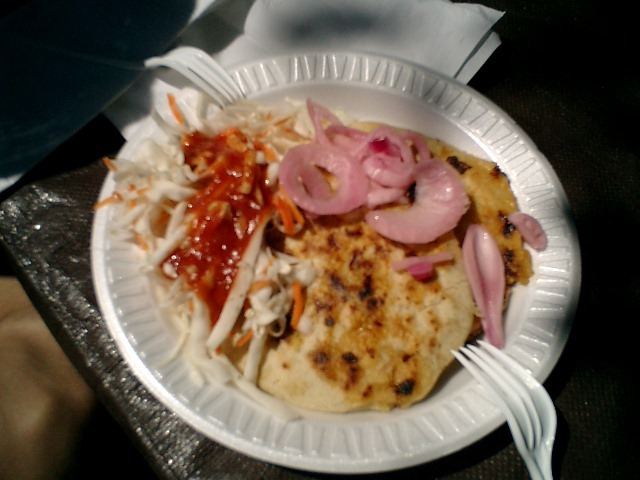 A special love: The pupusa and its sidekick the Salvadorean corn tamale! 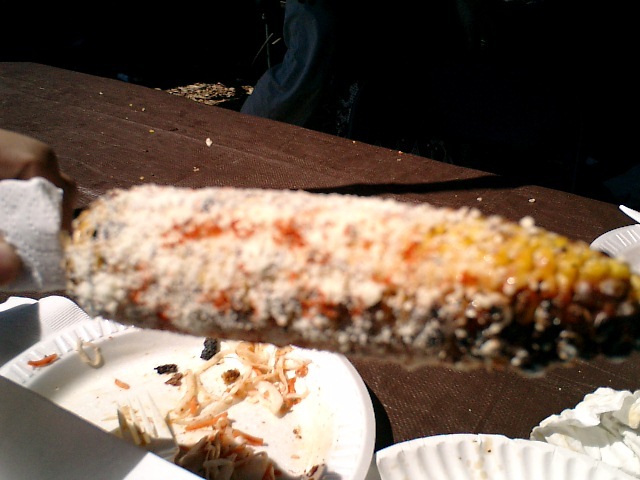 The corn tamale has no filling, it is solid fresh corn goodness that transcends its seeming straightforwardness… the process of transformation begins when this precious morsel is swaddled in corn husks, it is then mated with a cumulus cloud, it rains down from the sky above, where it is baptised with a plump and shiny dollop of cremalicious crema. In El Salvador November 13th is Día Nacional de la Pupusa “National Pupusa Day”, instead of describing this dish, I’m hoping that it suffices to say that this tender pocket of masa has a friggin’ day dedicated to it! and you shouldn’t die without having one…and there’s no better place than plopped on the verdant soccer lawns of sunny Red Hook.I love this place…from now on whenever I think of Red Hook, I’ll think “yummmmmmmm Red Hook”. This entry was posted on June 27, 2007 at 10:54 pm and is filed under *Diana, Brooklyn, el salvadorean, Mexican, new york, Umamiventure. You can follow any responses to this entry through the RSS 2.0 feed. You can leave a response, or trackback from your own site. mmmm… red hook. seriously the center of the universe. how many people did we bump into there? you guys knew everyone! 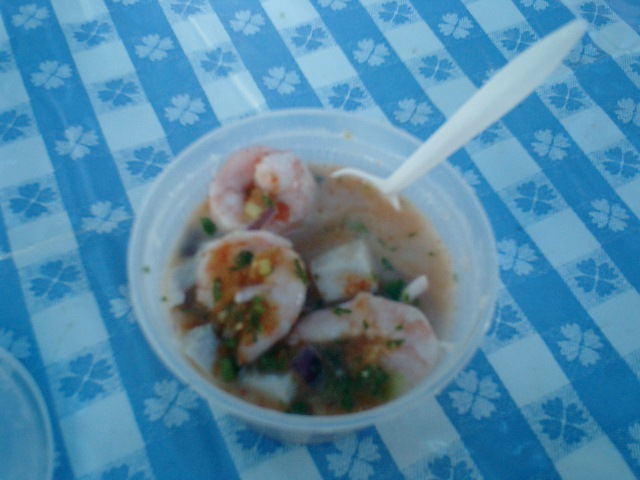 the cevice– all sorts of sea creatures: squid, big chuncks of fish– lots of cilantro and lime. tangy and acidic. delish. Huarache with chorizo– awesomeness. 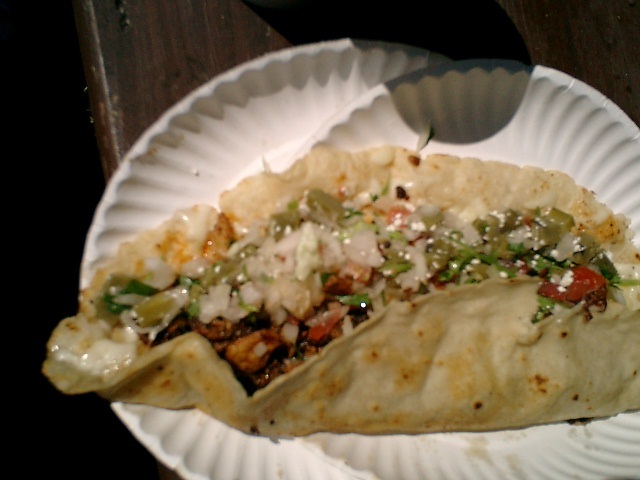 seriously, i’ll eat anything with chorizo in it, and this was just one huge soft taco- but better. watermelon juice– so refreshing on a hot day, while eating a chorizo huarache. great report Diana!!! so happy you are here.